If you are in Orlando this December, it would be a shame not to visit the biggest gift shop in all of Florida. Marges is well-known; not only for their size and vast scope of presents on sale, but also for their dedication in finding the best quality gifts and décor. We are also pleased to see that we have such a high ranking for those Google Shopping as many who find us share that it was through that powerful search engine. And as far as browsing, while many check out the Online Shopping Sites, there is nothing to take the place of the local brick and mortar locations where you can see, feel and walk out the door with that special gift right the moment. For many, not that big of deal, but for others … HUGE! As this post is being written in December 2013, of course the emphasis is on Christmas Gifts and all seem to have their Holiday Gift Guide ready. I’d say, begin shopping right here at Marge’s Specialties and see what you have left on that list before you spend time fighting the crowds. Marges also stocks a huge selection of Mark Roberts’ design in lamps, candle holders, ornate boxes, clocks and other goodies that would be perfect as a secret Christmas present for the one you love. If the more traditional is your style then you cannot go wrong with Marge’s stock of Caroler figurines from Byers’ Choice. Broadly collected across the United States and even in other parts of the world; Byers’ Choice figurines are known for their unique green felt ring and dated gold seal on the underneath of each figurine’s base. These beautiful figurines will be the perfect addition to your decorative collection on Christmas day and don’t forget to take a look underneath for the Byers’ Choice artisan signature proving each piece is unique. When it comes to filling those stockings and piling those presents high, nothing says “Welcome home and Merry Christmas” like one of Aromatique’s Decorative Fragrances. Have a look at the sizable collection while shopping at Marges this Christmas, with distinctive aroma filled botanical displays designed to bring your living room to life and make your family feel at home. And don’t forget the other room sprays, oils, candles, decorative containers and accessories that Marges have in stock for you this December. 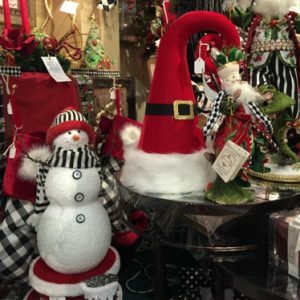 Make your home look, feel and smell like Christmas this year at Marges, Florida’s biggest Christmas store!